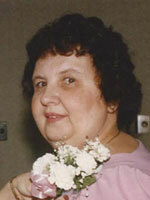 Mary Lou Myers, 79, of Lancaster, entered into rest on Friday, September 30, 2011 at Manorcare, Lancaster. Born in Lancaster, she was the daughter of the late Parke H. and Luella Vogel Behm. She was married for 60 years to George W. Myers. Mary Lou was a 1949 graduate of McCaskey High School. For most of her life she was a homemaker but previously worked part-time as a hostess and cashier for Watt & Shand and the Bonton in Lancaster. She had also worked in the snack bar at Kutztown University. She enjoyed traveling, boating, camping. A member of Westminster Presbyterian Church, she attended Women’s Bible Study Groups. In her quiet willingness to serve the Lord, she was always there to help when needed for a Clothing Give-Away and labeling newsletters for Center for Parent/Youth Understanding. In whatever contact she had with others, her smile always made a person feel welcomed! She enjoyed the simple things in life and was content in that simplicity. She was a woman of faith and was always concerned about her family’s well-being. Surviving in addition to her loving husband are 3 daughters, Linda A. wife of Kenneth Axe of Belleview, FL, Karen L. wife of James Maser, and Nancy J. Elaabar, both of Lancaster; a son, Thomas G. Myers of Lancaster; 5 grandchildren; 6 great-grandchildren. She was preceded in death by a grandson. A graveside service will be held from the Mellinger Mennonite Cemetery 1916 Lincoln Hwy East Lancaster, PA on Thursday, October 6th at 11 AM with the Pastor John Light officiating. In lieu of flowers, contributions may be sent to Hospice of Lancaster County P. O. Box 4125 Lancaster, PA 17604-4125.